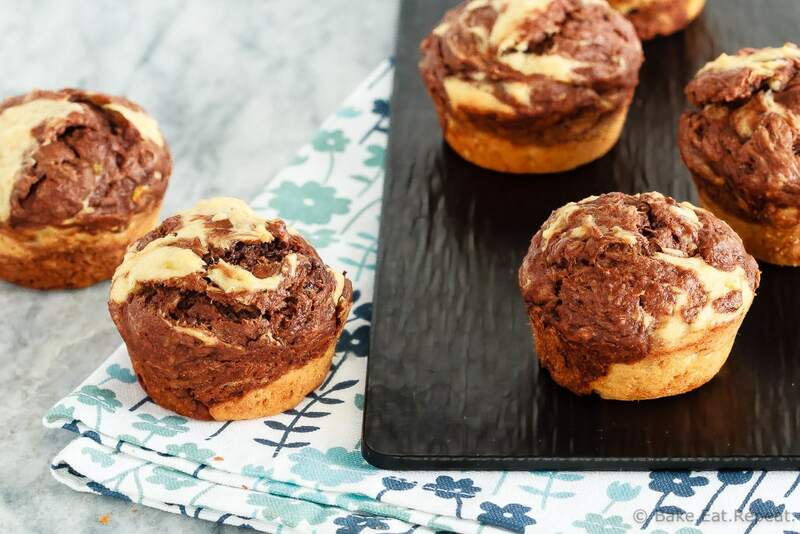 These marbled chocolate banana muffins, made with minimal sugar and plain Greek yogurt to keep them a bit healthier, make the perfect breakfast or snack! Marbled chocolate banana muffins that taste great, involve chocolate (which is always a win in my books), and look pretty. All good things. I’ve been making these muffins for several years, and they’re still one of our favourites. One of those recipes that I often turn to when I have overripe bananas begging to be turned into something delicious. 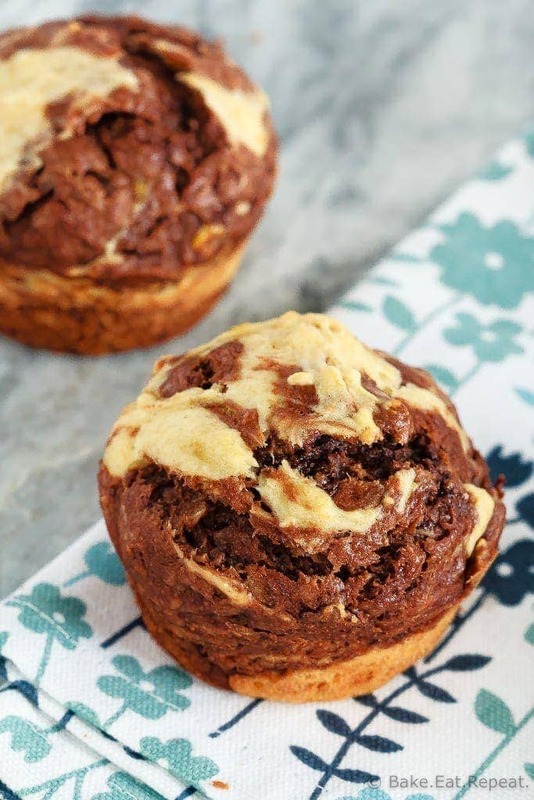 Although there’s so many recipes that I love to use those bananas in that it’s actually quite amazing these marbled chocolate banana muffins get made as often as they do. These peanut butter banana oatmeal bars, this healthy chocolate banana snack cake, and these banana pancakes, to name a few. And of course, I always have a list a mile long of recipes I’d like to try. So many recipes, so little time. So you know these marbled chocolate banana muffins are fantastic when I tell you that I make them quite regularly. They have to be great if I’m going to use up my baking time (and bananas!) with the same recipe over and over again! 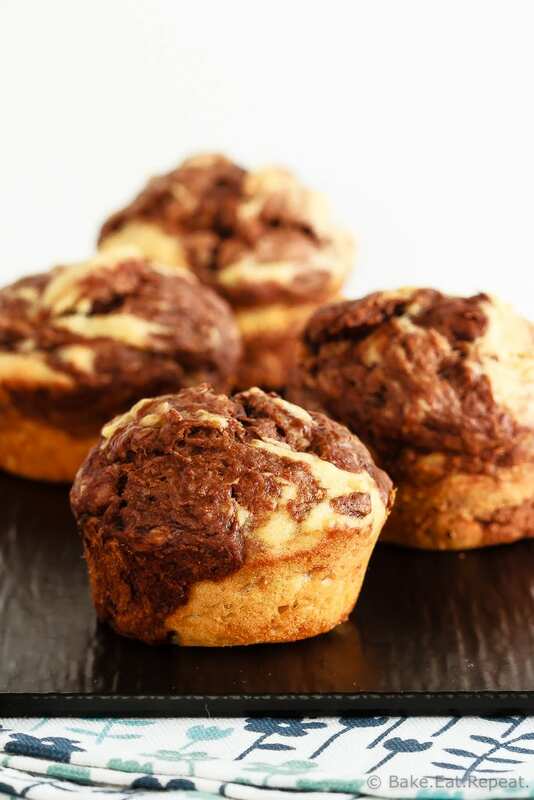 These muffins are filled with banana and chocolate flavour, but only use 2 ounces of semi-sweet baking chocolate. They’re made with half whole wheat flour (I’ve also made them with all white flour so use your preference) for a whole grain boost, plus plain Greek yogurt for some added protein. I really like using plain Greek yogurt in baking, it adds so much moisture without adding extra fat to the recipe. Quick and easy to make, they look pretty, and they have chocolate. That you can eat for breakfast. Definitely a winner. You should probably make some today. Preheat the oven to 350 degrees F. Prepare a muffin tin by lightly spraying with cooking spray, or lining with muffin liners. Set aside. Cream the butter and brown sugar together until smooth. Add the yogurt, bananas, egg and vanilla and mix until smooth and well combined. In a separate bowl, whisk together the all-purpose and whole wheat flour with the baking soda, baking powder and salt. Pour the wet mixture into the dry and stir until just combined. Move half of the muffin batter to a separate bowl and stir in the melted chocolate. Fill the muffin cups by alternating small scoops of each batter, about two small spoonfuls of each batter for each muffin cup, until the batter is all used up. With a toothpick, swirl the batters together gently in each muffin cup. Bake for 20-25 minutes or until a toothpick inserted in the center of a muffin comes out clean. Muffins keep well in a sealed container at room temperature for 4-5 days, or you can freeze them for up to 3 months. Ahh I am in love with the marbled-ness of these! They look delicious :) - What I would give for one with my coffee right now! Ha! I'm such a sucker for marbled anything too! Or if it has a swirl. These sound and look fantastic! I love all marbled goods, you get the best of both the flavors! these look great Stacey! They will be perfect as a post-workout snack! Thanks Manali! They would be good post-workout, get that chocolate boost without negating the workout! I'll need to make some more I think! 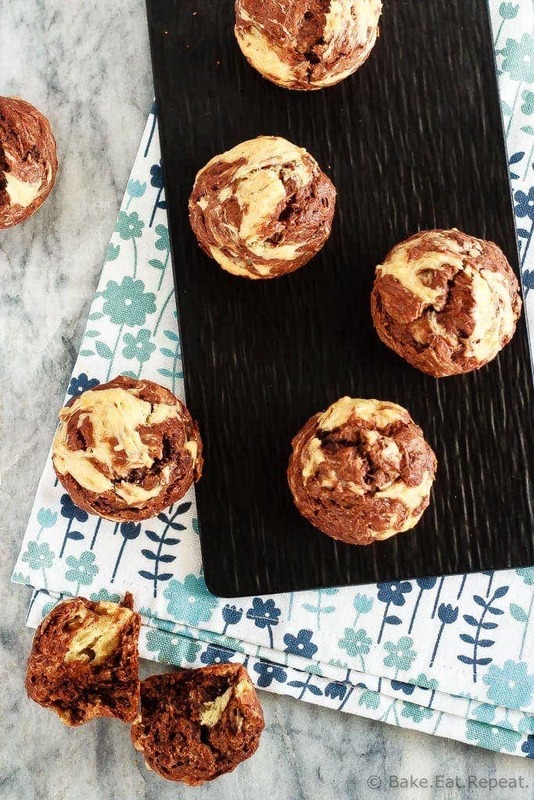 Banana muffins are my favorite, so I'm loving that you swirled in some chocolate! These look so moist and delicious. What a great breakfast or snack, Stacey! Yes, these are super pretty! Good call on the Greek yogurt - adds moisture plus protein too. Great idea! Thanks for sharing!